PLEASE NOTE BELOW RE THE SLEEP OUT. Being in Pauanui means a short1.5 to 2 hour drive from major cities of Hamilton or Auckland, or Tauranga, or Rotorua international Airport and is an ideal holiday destination, as well as a great base fro exloring the Coromandel. The house sleeps 6 people 2 queen bed and a double. PLEASE NOTE - BOOKING THE HOUSE DOES NOT INCLUDE THE SLEEP OUT - THAT IS EXTRA. The sleepout sleeps 8 and is $110 per night for 2 people and then $30 per night for each extra person. As yet the site cannot calculate the rental for the sleep out. For 2 people - $110, 3 people $140, 4 people - $170, 5 people - $200, 6 people - $230, 7 people $260, 8 people - $290. RUBBISH MUST BE TAKEN AWAY EXCEPT DURING THE END OF DECEMBER AND JANUARY WHEN COLLECTION IS FREQUENT. ON DEPARTURE LESS THE $100 CLEANING FEE. Black Bach is 50 metres down the private walkway to the beach, half way between the airfield and southern end of the beach. This is our beach house and we ask people to use it as they would their own homes, leave it as you find it. Its a family-safe house - no carpet to worry about. There is an outside shower to wash salt and sand off. The Black Bach is a comfortable Harmony Home. There is a sleepout with bathroom containing 2 double bottom with single bunks on top and a single bed with trundle bed - so sleeps 8 available for an additional $110 per night for 2 people plus $30 per each extra person. You don't have to make it an expedition to go to the beach - forget something, only 2 minutes to shoot back to the bach to get it. Pricing varies with numbers of visitors. YOU MUST TAKE YOUR OWN SHEETS AND TOWELS. Preferred no smokers, but if anyone smoking outside must use container for rubbish. 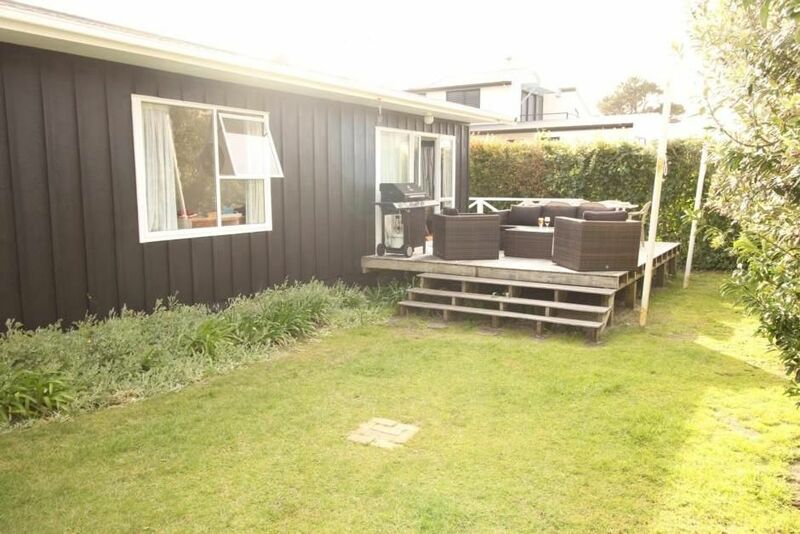 This bach has been in the family since it was placed on the land in Pauanui in about 1983. Four steps up to deck. We really enjoyed our stay, thank you. Just a small thing, when I lifted one of the mats in the bedroom my mum was in (as I thought she might trip on it), there was a lot of sand on the floor and it was the same under all of the mats and the floor in general was sandy. I'm conscious that you have a cleaner come in after stays so wonder if you need to check with the cleaner about a better clean of the floor (there were also old spill marks on the lounge floor). There were also bottles in the green bin when we arrived - we added a few thinking that you must have a system for taking the green bin and yellow bin (which was full also) to the kerbside for collection - but did take away our rubbish. Really enjoyed being able to walk out to the reserve and beach. This is by no means a grumble but more about letting you know about the floor and sand. Many thanks for a lovley stay. Thanks for letting me know, I will follow that up. Glad you enjoyed yourselves. Fantastic location loved our stay. Great property especially the sleep out. Great property especially the sleep out. Bach is well equipped... only issue we had was the bbq was not ready to use. The property was very nice and the location was perfect. The property was very nice and the location was perfect. It was great bach for our holiday. We will stay again.